Chinese smartphone company Xiaomi just launched its new flagship smartphone in July, but it may have already started thinking about what’s next. A photo that surfaced on Chinese social network Weibo reportedly shows what the company’s Mi5 phone will look like. The image, which has been making the rounds on various gadget blogs such as GSM Arena, Phone Arena, and Trusted Reviews, supposedly came straight from Xiaomi’s production line. 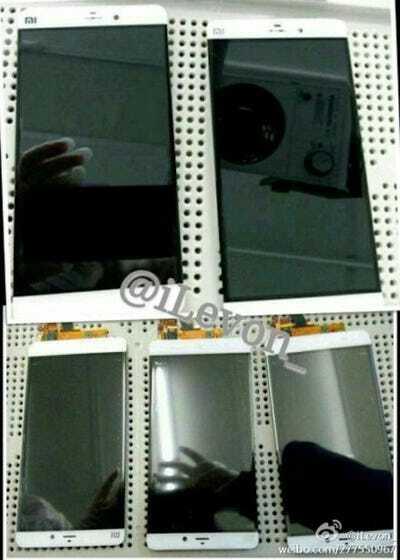 If the photo turns out to be accurate, we can expect Xiaomi’s next phone to offer a gigantic screen. There are virtually no bezels along the side of the display, which gives the phone a slim and premium look. It appears to be significantly bigger than the Mi4, which received positive reviews from critics upon launch. Xiaomi is one of the buzziest smartphone makers out there today, even though it only sells phones in China and a few other markets. It recently just passed Samsung to become the No. 1 smartphone maker in China during the second quarter of this year, as reserach firm Canalys reported. It’s also the third largest smartphone maker in the entire world in terms of global shipments, according to Bloomberg. That means Xiaomi falls right behind Samsung and Apple, and the company is also believed to be raising money at a $US40 billion valuation.